Persistence Market Research presents a comprehensive analysis of the global Spirulina market in a new publication titled ‘Spirulina Market: Global Industry Analysis and Forecast, 2016–2026’. In this report, Persistence Market Research has focused on offering detailed insights and in-depth research on the global Spirulina market over a 10 year forecast period 2016 – 2026. In this report, we have covered the important factors driving the expansion of the global Spirulina market, untapped opportunities for market players in this field, trends and developments shaping the dynamics of the global Spirulina market and other insights across various key segments. In addition, we have identified the key drivers and restraints affecting the development of the global Spirulina market. Changing trends are also analyzed and incorporated in the report to equip the client with exhaustive information about the market resulting in better decision making. Macroeconomic factors that directly and indirectly affect the performance of the global Spirulina market are also incorporated in the report. The global Spirulina market report begins with an executive summary and defining various categories and their share in the global Spirulina market. It is followed by market dynamics, overview of the global Spirulina market, which includes Persistence Market Research’s analysis of market drivers, restraints, opportunities and trends that are affecting the growth of the global Spirulina market. Furthermore, to understand the popularity of the market segment and regions, a market attractiveness index with elaborate insights on the same is provided, to showcase the market’s attractiveness based on metrics such as CAGR and incremental opportunity. The next section of the report highlights Spirulina adoption by region and provides a market outlook for 2016–2026. The study investigates the market attractiveness regionally, as well as analyses the limit to which the drivers are influencing the Spirulina market in each region. The sections, by product form and by application evaluate the present scenario and future growth prospects of the global Spirulina market for 2016–2026. In the final section of the report on the global Spirulina market, a dashboard view of key companies is provided to compare the current industrial scenario and their contribution to the global Spirulina market. Moreover, it is primarily designed to provide clients with an objective and detailed comparative assessment of key providers specific to a market segment. Report audiences can gain segment-specific manufacturer insights to identify and evaluate key competitors based on an in-depth assessment of their capabilities and success in the global Spirulina market. Detailed profiles of Spirulina production companies are also included in the report to evaluate their long– and short–term strategies, key product offerings and recent developments in the global Spirulina market. To ascertain the global Spirulina market size, the report takes into account the revenue generated by the various manufacturers. The forecast presented here assesses the total revenue generated by value across the global Spirulina market. In order to provide an accurate forecast, the report starts by sizing up the current market, which forms the basis of how the global Spirulina market is expected to develop in the future. Given the characteristics of the market, the outcome is triangulated on the basis of three different types of analysis – based on supply side, downstream industry demand and the economic envelope. In addition, the report not only conducts forecasts in terms of CAGR, but also analyzes the market based on key parameters such as year-on-year (Y-o-Y) growth rates to understand the predictability of the market and to identify the right opportunities across the market. Further, the different market segments have been analyzed in terms of basis point share (BPS) to understand segmental contribution to market growth. This detailed level of information is important for identifying various key trends governing the global Spirulina market. Another key feature of this report is an analysis of key segments in terms of absolute dollar opportunity, critical in evaluating the scope of opportunity that a provider can look to achieve, as well as to identify potential resources in the global Spirulina market. The overall absolute dollar opportunity along with the segmental split is mentioned in the report. Finally, to understand key market segments in terms of their growth and adoption of Spirulina globally, Persistence Market Research has developed the global Spirulina market attractiveness index to help providers identify real market opportunities. Spirulina represents a biomass of cyanobacteria that can be consumed by humans and other animals. Mainly there are two species of spirulina which are being further processed for various applications. These include Arthrospira plantensis and Anthrospira maxima. Arthrospira is cultivated worldwide and is used in dietary supplements and also as whole food. It is available in tablet and capsule, flakes, powder, and liquid form. Further, spirulina is also used as a feed supplement in aquarium, aquaculture, and poultry industries widely. 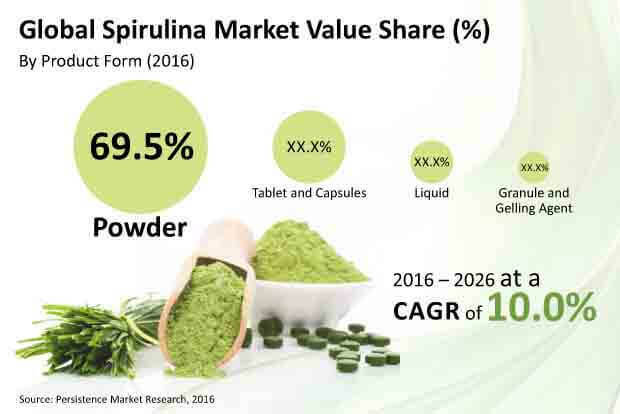 The global spirulina market is expected to register a CAGR of 10% during the forecast period, and is estimated to be valued at nearly US$ 2,000 Mn by 2026, from more than US$ 700 Mn in 2016 owing to factors such as increased application of spirulina in cosmetics. Moreover, the EU government regulations have become stringent and have banned the usage of synthetic food colors in the food industry, which is expected to boost the sales of spirulina based natural food colors in the region during the forecast period. Factors such as launch of new varieties of natural food colors produced from spirulina, natural health benefits of spirulina super food, and various government initiatives pertaining to the production of spirulina are expected to spur the growth of the global spirulina market during the forecast period. The governments of various countries have started promoting the production of spirulina to strengthen the market and create a decent income source for the rural population. The governments of many countries such as India, Angola and Ghana are actively supporting the local spirulina market and building a strong gateway for the development of this superfood which can change the course of food for the entire race. EFSA, the regulatory agency of EU countries for food safety has banned the use of synthetic colors in the products consumed in EU countries which is boosting the growth of the natural color market. The Blue Spirulina color has become the most attractive color globally due to its features and texture and is primarily used in the food and beverage industry. Spirulina holds anti-oxidants, hypolipidemic and anti-inflammatory properties due to which it is witnessing a high growth in demand among the food and beverage and cosmetics industries. Antioxidants protect the body from damage caused by harmful molecules (free radicals) which improves the health of a person. Spirulina consists of Vitamin A, C and E and beta-carotene in large quantities with a minimal quantity of Lutein Zeaxanthin – all these are antioxidants that help in curing various diseases and medical conditions. Changing consumer preferences toward nutritious and healthy products is the new trend for which companies are launching innovative products to supplement the demands of the modern society. For example, Naked Juice launched their 100% juice range that consists of spirulina as a primary ingredient. Key trends identified in the global spirulina market are an increased production of ready-to-drink smoothies prepared from spirulina and the surging demand for spirulina in the bio-fuel industry, which is expected to boost the demand for spirulina during the forecast period. Among the Product Form segments, the powder segment is expected to register the highest value CAGR of 10.4% during the forecast period. This is attributed to increasing usage of the powder form of spirulina in food. The powder segment was estimated to account for the highest value share of 73.5% in 2016 and the segment is expected to gain significant market share by 2026 end. The tablet and capsule form segment is anticipated to register the second highest CAGR of 8.8% in terms of value over the forecast period. In terms of volume consumption, the powder segment is projected to register the highest CAGR of 10.2% over the forecast period. Various natural colors have been invented using Spirulina, and many more are yet to come. Spirulina Blue, a natural color produced from green-blue Spirulina received approval from the FDA in 2013, which opened a whole new segment for Spirulina products. Natural blue and green color produced from Spirulina is in high demand and has witnessed a strong market growth in the last two years. Many companies such as GNT Holdings B.V., DIC Corporation, DDW Inc., Chr. Hansen Holding A/S and Sensient Technologies Corp. are producing Spirulina Blue which still seeks more producers due to increasing demand. DDW Inc. has launched an innovative blue color made from Spirulina with light stability improved by up to 40%.